Thanks for the mention of my post on the PARC WikiDashboard, and its potential. Although I whole heartedly agree that quantity does NOT eaqual quality when it comes to evaluating student work, I think that this tool still meets evaluative requirements for two reasons. 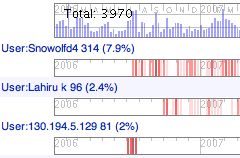 The firs is that the tool allows you to quickly visualize the amount and frequency of contributions AND hot links directly to the “diffs” analysis of that work. In other words, as the teacher you can quickly click on the specific contributions each student made and analyze the quality of that work by “drilling down”. The tool in this case does not analyze, but rather makes it manageable for the teacher to do the evaluation. GIVEN enough peer or other review – shows the impact of any user’s individual content to that page. Therefore, in a “healthy” wiki, or one that has lots of “eyeballs” and/or good eyeballs on the content, the quality work that has survived the editing process should in and of itself one measure of better work. I realize that this does not replace the teacher’s role, but should be one indicator of “better” work if the wiki is a healthy one. In any case, I do agree with your premise that quntity is not quality, and appreciate the link. Thanks, John – good points! I agree that the WikiDashboard has a lot of potential to help analyse student contributions to a wiki. I often have to help lecturers develop or review assessment processes, and sometimes those new to working with web tools don’t always fully grasp at first the distinction between quantity and quality: hence my post.